There are some words in our vocabulary that will, for the most part, always be associated with preschoolers. "No." "Mine." "Gimme." These words are usually accompanied by a pull, a grab or a hugging motion to the chest -- in all cases, the preschooler is holding a precious (or not-so-precious) item, something that they don't want someone else to have. Teaching kids to share something they don't want to give up can be a daunting task, but it can be done. Here's how. Set a good example. If you want your preschooler to learn to share, then you must share with her. If you are snacking on apple slices, offer her one. Does she love to color with your markers? Let her draw a picture with them. Put sharing into action by modeling good behavior. Share things with your spouse or partner and draw attention to the action. "Thanks Daddy for sharing your popcorn with me. I love it when we can share a snack together." Remember that your preschoolers things and toys are his world. Respect them. Just because he's small and didn't purchase the items in question, they are still his. If you need to borrow something, be sure to ask and say thank you when you are finished. Make sure siblings follow suit. Most importantly, make sure the item in question is in good condition when you return it. Make sure your preschooler knows what sharing is and that when you share a toy with someone, they don't get to keep it forever. If she doesn't want to share her doll, set a timer and explain when the timer goes off, it's time to let the other child have a turn. When she sees that she will get her doll back, she may be more likely to give it up in the future. Find out why your preschooler doesn't want to share a particular item. Was it a special gift from someone? Is it brand new? Before you discipline your child for not cooperating, find out why she's behaving this way. Sometimes you can hit a stumbling block when another child won't share with your little one, but it's still a great opportunity for teaching. Have your child put himself in his friend's shoes to figure out why his friend doesn't want to share. Say something like, "I think that toy is really special to your friend. Why don't you find something else to play with?" Show her that sharing is a fun thing. Do activities and games that are great for two or more -- work on a puzzle, play a board game or bake cookies together. When the goal is met -- the puzzle is finished or the cookies are ready to eat -- talk about how great it was to share that activity with her. Recognize when it is OK not to share. Sometimes there are items that your preschooler just isn't ready to give up. And that's fine. If you force him to share something he's not ready to give up, it could backfire, making him resentful instead of generous. 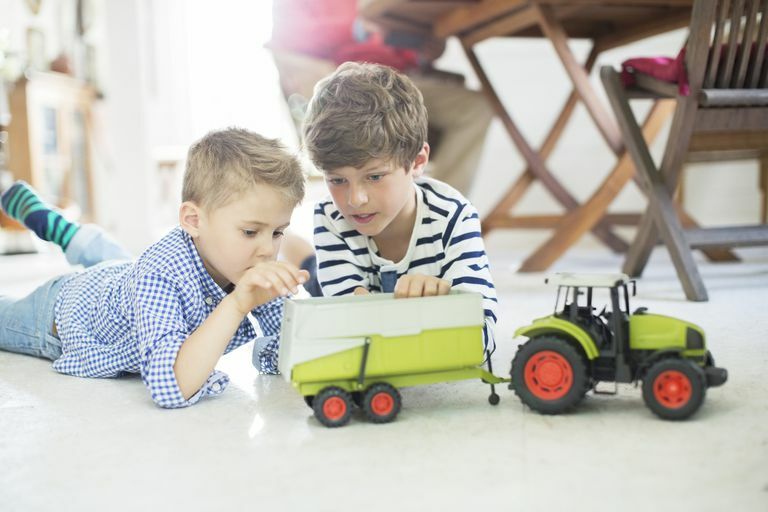 Before a playdate begins, go through the house and have your little one pick out items he'd rather not have someone else play with. Put them in a special place. Then go through and pick out things that are great for sharing -- art supplies, puzzles, board games. This will set a good tone. Use positive reinforcement. Give her things to share with friends on a playdate or at school like stickers, a snack for the class or small toys. When she sees that sharing can be fun, she'll be more likely to do it on her own. When a friend comes over for a playdate, ask the child's parents if they can bring a toy or two to share. If your preschooler sees that his friend is sharing his stuff, your child may follow suit. Be patient. Time is a great equalizer. As your little one develops social skills and makes some real friends, she will soon realize that sharing is fun and that playing with her favorite doll with a friend is much better than playing alone. Remember that sharing doesn't always involve tangible items. Sit down and share a story or an activity. And use she word "share" often in your vocabulary. The more your preschooler hears the word share, the more it becomes common and second nature. Point out good sharing when you see it. Did you he get a goody bag at a birthday party? Say how nice it was for the birthday boy to share with friends on his special day. Did a friend share a snack on the playground? Make sure both you and your little one say thank you. And most importantly, when your preschooler shares, be sure to notice.